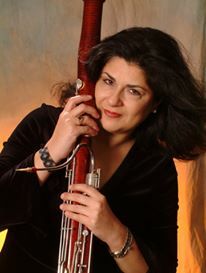 Elisabeth Romano began studies on the bassoon when she was 16 with William Polisi, former Principal Bassoonist of the New York Philharmonic and NYC Radio Orchestra, and with Harold Goltzer, former Associate Principal Bassoonist of the New York Philharmonic, while studying in Julliard’s Pre-College Division. Elisabeth received her Bachelor’s Degree and Performer’s Certificate in bassoon under the teachings of K. David Van Hoesen. Upon graduation she joined the Rochester Philharmonic Orchestra as first-call substitute in 1984. By invitation she was asked to join the San Antonio Symphony Orchestra for the 1985-86 season as Assistant Principal and Second bassoon. From 1986-89 she was a tenured member of the Toledo Symphony Orchestra as Second bassoonist or the Toledo Symphony Woodwind Quintet and Toledo Opera Orchestra. She yearned for a faster pace of life and upon leaving Toledo, she settled 90 miles north of New York City in the Hudson Valley. She has performed many concerts with the Jupiter Symphony, the Hudson Valley Philharmonic, Hudson Valley Bach Festival, Albany Symphony, Newburgh Symphony, Sol Sonata, Arabesque Trio, Con Spirito Woodwind Quintet, New York Gilbert & Sullivan Society, Northern Dutchess Symphony Orchestra, Music Specialties, and she actively freelances for other chamber music and symphonic organizations in the New York Area. Elisabeth is currently principal bassoonist and has appeared several times as soloist with the Woodstock Chamber Orchestra. She is also a member of the woodwind trio Bella Winds and Three’s a Charm ensemble, performing several recitals with both ensembles every year. She is studio faculty at Vassar, Bard and Marist Colleges, Mountain Laurel Waldorf School, Dutchess Community College Music School, and teaches young students in her private studio in Gardiner, New York. Reed Expertise began in 2005, and Elisabeth is happy making reeds for students and professional bassoonists. She consults regularly with her lifelong teacher, Mr. Van Hoesen, on new and exciting reed developments.